Manfrotto has updated its Pro Light RedBee range of backpacks with new RedBee-310 and RedBee-110 models. Designed for professional photographers, enthusiasts and videographers, both bags are designed to carry a substantial amount of camera kit. The Pro Light RedBee-310 can accommodate a large 400mm telephoto lens attached to a pro DSLR, while there's also space for another DSLR body and an additional 2-3 lenses. Alternatively, the RedBee-310 allows you to pack away a modular video camera and lenses. Access to kit is via the rear of the bag for security, with quick access points at the top and sides, while there are flexible dividers and a zippered mesh system to keep camera kit separate from other items, such as a 15-inch laptop or tablet, rain cover. The Pro Light RedBee-310 is priced at £159.95 in the UK, with pricing for the US and Australia still to be confirmed. 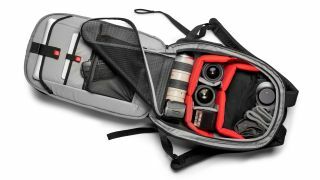 The smaller of the two bags, the Pro Light RedBee-110 can safely carry two premium mirrorless camera bodies, a 70-200mm lens and additional lenses. Alternatively, it can accommodate one high-end mirrorless body, a foldable drone and a handheld camera gimbal. As with the RedBee-310 there's rear access to kit, while there's also space for a 13-inch laptop. The Pro Light RedBee-110 is priced at £139.95; again, pricing for the US and Australia is to be confirmed.